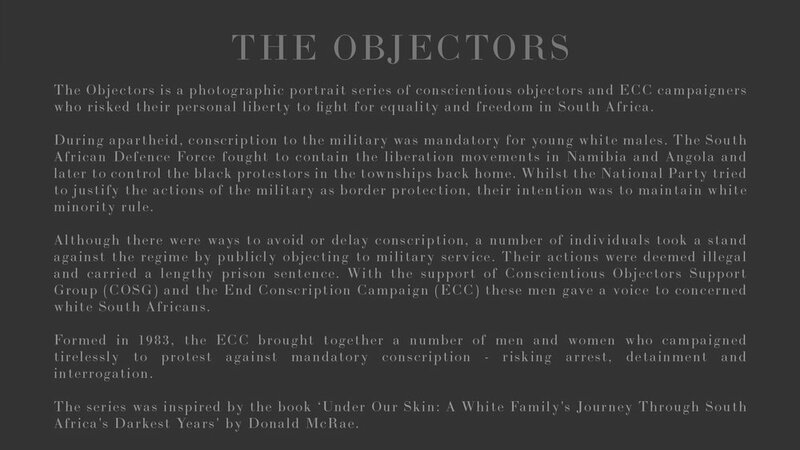 The Objectors is a photographic portrait series of conscientious objectors and ECC campaigners who risked their personal liberty to fight for equality and freedom in South Africa. In South Africa, during apartheid, conscription to the military was mandatory for all young white males. The South African Defence Force fought to contain the liberation movement in Namibia, Angola and later to control the black protestors in the townships back home. Whilst the National Party tried to justify the actions of the military as border protection, their intention was to maintain white minority rule. Although there were ways to avoid or delay conscription, a number of individuals took a stand against the regime by publicly objecting to the military service. Their actions were deemed illegal and carried a lengthy prison sentence. 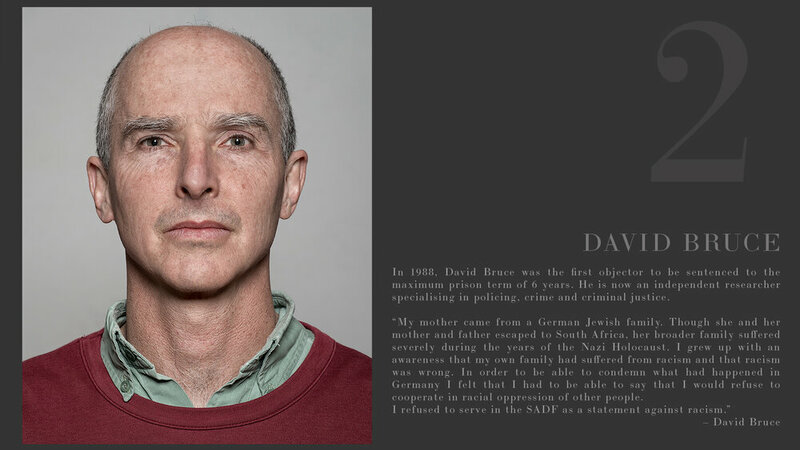 With the support of the Conscientious Objectors Support Group (COSG) and the End Conscription Campaign (ECC), these men gave a voice to concerned white South Africans. Formed in 1983, the ECC brought together a number of men and women who campaigned tirelessly to protest against mandatory conscription - risking arrest, detainment and interrogation. This series was inspired by the book 'Under Our Skin: A White Family's Journey Through South Africa's Darkest Years' by Donald McRae.